My 8 years at HTS were evenly split between the old and new schools. Last Saturday, there was a "garage sale" in the school cafeteria. After a perfunctory look at the merch, I walked through a dark hallway and up 2 flights to try to get some cellphone photos of my 5th, 6th, 7th, and 8th grade classrooms before whatever happens to the now-closed school happens. Those halls were also pretty dark because all the classroom blinds were drawn and 3 of the 4 classroom doors were locked, so shot variety was pretty limited. The rooms didn't appear to be designated "5A", "5B", etc., as they were way back when, so I don't know what grades last used what rooms. Doesn't matter - I knew which rooms I did my learnin' in. Let's start with 5A. When you climb the steps on the Pangborn Place side to the second floor, you turn left into the hallway. The first room on the left was 5A. The first image below is the photo I got through the window of the 5A door. Below that is our 5A class photo from 1957. Notice that little has changed...........the floor and even the desks look exactly the same 52 years later! The 6th grade classroom (third picture) was the only one that was unlocked. The next picture shows what the nuns quaintly referred to as "the cloakroom". The next 2 pictures show my 7th and 8th grade classrooms with the same ancient desks and floors. I don't recall the horrid classroom colors. Either I've blocked it out or it's the only visual "improvement" made in a half-century. Time for a pit stop and one final second-floor memory, facing east and west. Then it was time to head back downstairs to the cafeteria, where I took a photo of the building where I spent the first 4 years of my HTS life. I DID enjoy my 8 years at HTS and got a great education, but have no special feeling for the building. I don't know what's to become of it - one man I spoke to in the cafeteria Saturday mentioned a possible movement to bring the school back - so I look at this as my goodbye tour...........something I needed to do. Thanks for the pictures. They take me back. I remember walking up those stairs and through the hallways in a row of boys, next to a row of girls, both ordered by height, shortest to tallest, always walking in complete silence and stopped if there was so much as a whisper. I remember being responsible for a clean desk, with books stacked neatly underneath, no hanging scraps. I can't believe those original desks survived the school. I want one for my daughter. I remember the seldom-used black phones hanging on the walls. A voice at the other end would tell us to turn on the b/w TV for important news, send someone to the principal's office or discuss early dismissals for snow. Sometimes we were kept in the dark about the call and were free to speculate: The Pope was coming; they dropped the bomb, so-and-so was expelled. One sad day we where told to tune into the aftermath of the Challenger space shuttle disaster. I remember Mrs. Ferris, the elderly and wonderful Art teacher who would hand-paint flowers on the windows every Spring for years and years. I'm showing my daughter how to draw flowers like Mrs. Ferris showed me. Teachers, faculty and ordained, were strict but fair. Hard work was praised and bad behavior corrected. My class (Class of 1986 a/k/a "best class ever") didn't have the ideal elementary education, but most classmates would agree that each got the attention he or she deserved, for better or worse. Despite the normal side affects of a Holy Trinity education like chronic guilt and obsession with Grammar, I am grateful to the school and parish for my elementary education and am sad to see it go. Farewell. I proof-read this four times and am sure I still made some mistakes. I'm very sorry and will do better next time. 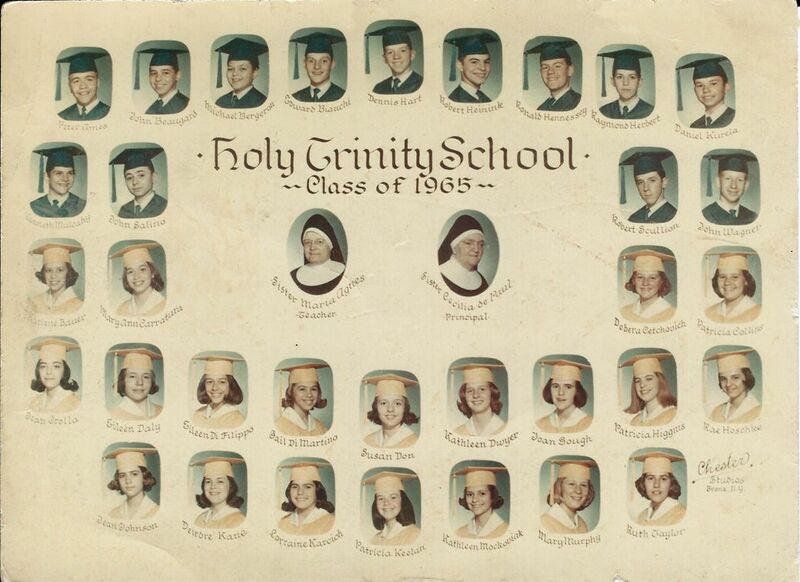 I lived on Maple Avenue from the fifth grade through my freshman year in high school (Paramus Catholic), having graduated from Holy Trinity in '65. Sister Emily and Sister Maria Agnes were the eighth-grade teachers. The principal was Sister Cecilia de Paul after Sr. Louise's tenure. I can't remember if Sr. Louise had died or retired. Sister Margaret de Paul (not sure if she was related to Sr. Cecilia) and Mrs. Fiore were the seventh-grade teachers; Sister Margaret Fidelis was my sixth-grade instructor (think Mrs. Frascas was the other sixth-grade teacher). Mrs. Moran and Sister Gerard taught the fifth grades. Thanks for the previous photos on the board. Brought me back to when Sister Gerard grabbed me by the collar and spun me around a few times in the hallway, my landing supine on the second floor after being caught talking in line on the way back to Mrs. Moran's classroom from lunch. The nun was a small woman to boot. The boys-room photo stirred a memory of my having a fist fight with a classmate in there during the fifth grade, being broken up by Sister Juliana, who was teaching fourth grade next door at the time. We were sent down to Sister Louise, the aforementioned principal, who smacked us both across the face at once, twice like Moe of the Three Stooges would do to his cohorts, Larry and Curly. My main reason for registering with this forum and writing this was to make a comment about the boy on the tricycle, who lived directly across from the playground-parking lot, which was two houses southeast from where I resided. His name was David. I would talk to him whenever he pedaled past me on the sidewalk. Although Dave was unable to speak words, he communicated with grunts and always with a smile, happy to get attention, I suppose. The church organist was not his mother. From being an altar boy, I remember the organist was a handicapped gentleman, crippled, who was carried up the narrow, winding stairs to the choir loft by his wife who sang hymns to his accompaniment. I can't remember their names, unfortunately. If I think hard enough, maybe it will come back to me. I want to say Mr. and Mrs. Donnelly on second thought. I ran across this forum from looking up on Yahoo about Holy Trinity School, and why it had closed down, reminiscing today about my hometown where I was born. A few years ago, I visited Hackensack, doing a photo-shoot of the N.Y.C. skyline, passing through and hadn't been there in decades. My home is now outside of Philadelphia, in a section of Bensalem Township called "Andalusia." Driving through my old neighborhood, I noticed the school was now a charter school, breaking my heart; but figured the parish couldn't afford upkeep any longer, as has been the case with many Catholic schools of late. I found a few articles about how Holy Trinity incorporated with St. Francis School on the south side of town in 2009, as they were having financial problems, both being housed in the latter's building, for recent renovations had been performed. Then I read the combo-school, renamed "Padre Pio Academy," had been closed down by the archdiocese four years later (2013) for financial reasons and low enrollment as well. Too bad. In my Internet search, a listed obituary noted my favorite priest from Holy Trinity, Father Gene Hazewski, had died last May. We'd play basketball with him in the school gym, or stick ball in the parking lot. I loved to serve Mass for him, as he went through the ceremony faster than the rest: Fr. Geila (sp? ), Fr. Lang, Msgr. Murphy—who retired before I graduated HTS, and was responsible for building the new school—and Fr. DeDominco (the slowest of the bunch). Fr. Lang had baptized me as well. On a pleasant note, I found this heartwarming article: http://www.scnj.org/images/sisterstories/Sister%20Emily%20Walsh%20sister%20story.pdf , stating that Sister Emily was still alive as of 2014, hoping now she's still with us. After Maple Avenue, my dad and I moved to Elm Avenue in the Fairmount section of the city, living there until I graduated from high school.